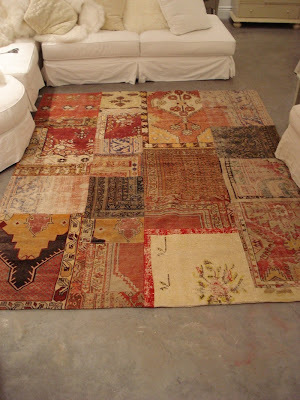 Grant K. Gibson - the blog: Patchwork rugs are everywhere I look! Patchwork rugs are everywhere I look! From the pages of House Beautiful in March with the rooms decorated by Albert Hadley- from my trip to Paris last fall- The Rugby Ralph Lauren store in New York on University Place-The RL mansion- Shabby Chic (which I just learned is closing)- STARK carpet showroom in the D&D in NYC- and even on ebay! 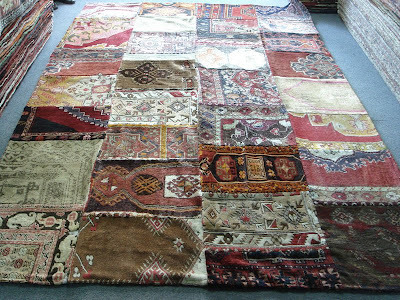 Tattered- cut up rugs- of all sizes and colors and mix matched and sewn together to make a whole new look. kinda fabulous, the rugs. you too, of course. Awesome! 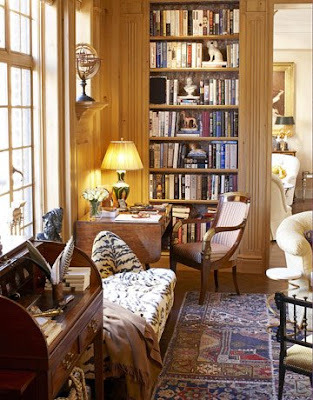 So eccentric-old-money-bohemian...I love it. Nice way to recycle....I kinda like! Oh I love this idea too! 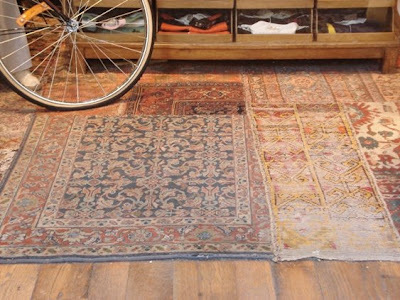 I lost a few rugs in storage recently to moth damage. Some areas are still good and others beyond repair. What a great way to salvage them.